Trimming a video allows you to remove portions of the original recording in order to produce a final video clip which displays only the desired content. This process will also allow you to reduce the length (minutes) and overall size (MB) of your video to meet any duration or size requirements. Important note for edTPA Candidates: Each clip should be continuous, without any disruption in the footage for the duration of that selected segment. 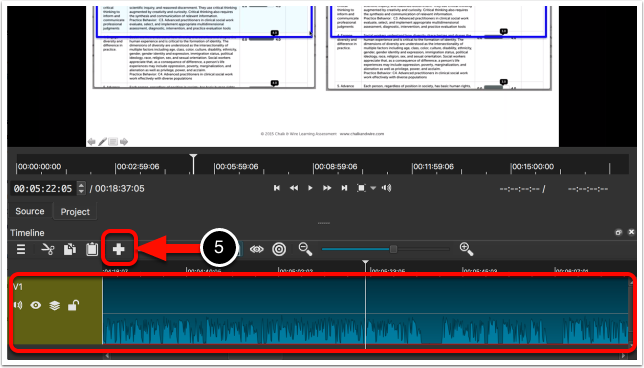 Any break in the continuity of events signals the start of a new clip to scorers, so count the number of clips/excerpts submitted as evidence carefully. Caution: Breaks within a clip due to impermissible editing may also cause scorers to apply condition codes, as indicated in the submission requirements. 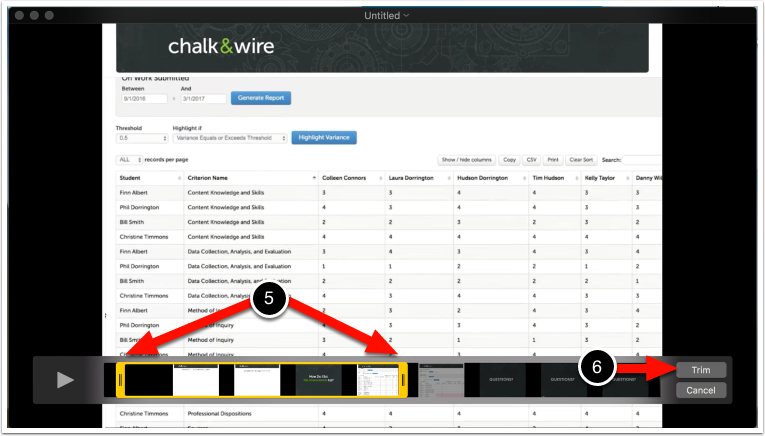 While tools to trim videos are not available in Chalk & Wire, there are many free options available for download. Our recommendations are listed below for both Mac and Windows users. Most Mac computers come with Quicktime™ installed. If it is not installed on your computer you can download it here. 1. Click on the File menu and select Open File. 2. 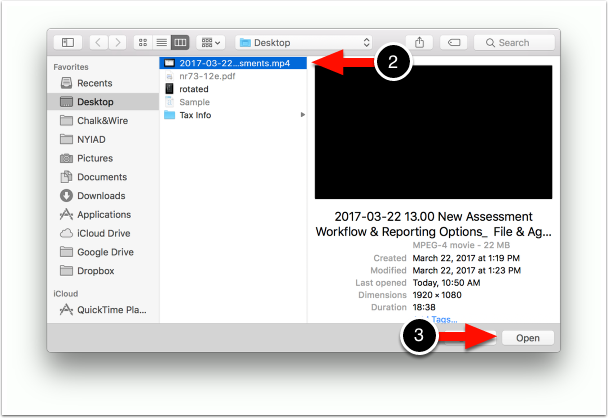 Locate the file in the browsing window. 4. 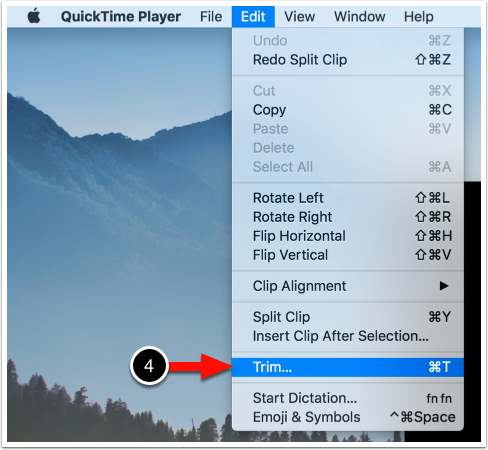 Use the Edit menu to select Trim. 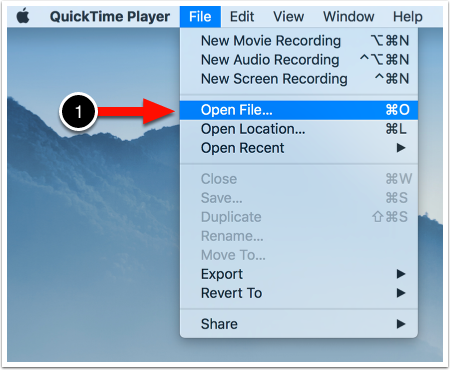 A yellow border will appear around the video track at the bottom of the Quicktime™ screen. Any of the video that is outside of the yellow border will not be included in the video after you finish trimming. 5. Drag the front and/or end of the yellow border to include only the video that you would like to keep. 7. 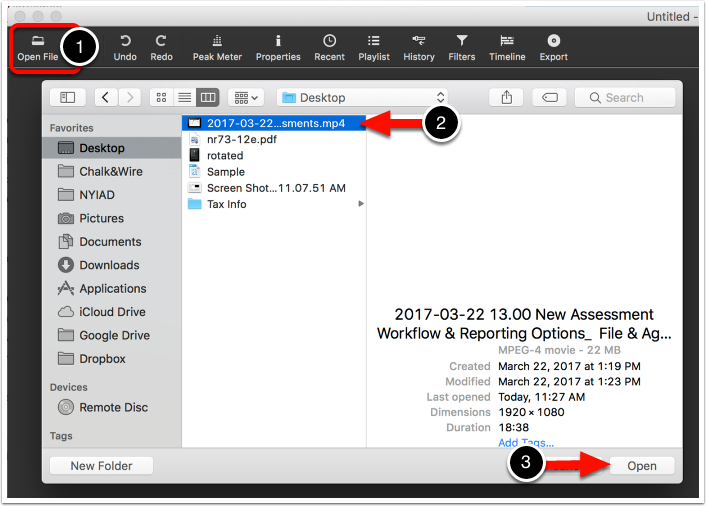 Click on the File menu to select Export. We recommend exporting at 720p, though this can produce a large file. 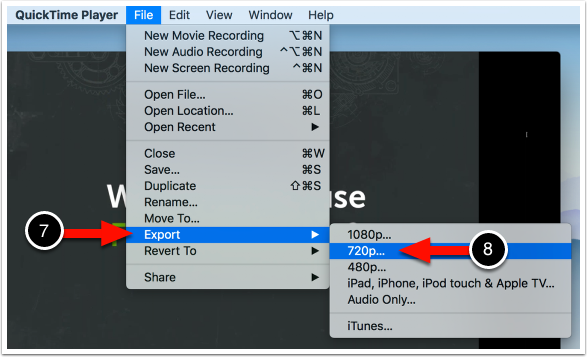 If your video size is too large (even after compression), you may consider exporting at 480p. 9. Enter a File name for the video. 10. Select the Location for saving the video. Please note that we no longer recommend using Windows Movie Maker™ for trimming videos as Microsoft stopped supporting the program as of January, 2017. We now recommendation Shotcut™ for trimming videos on Microsoft computers. Shotcut™ is our official recommendation for Windows-based users who do not have access to Windows Movie Maker™ (Microsoft stopped it in January 2017). You can download Shotcut™ for free here. 1. Use the Open File button to open the file browser. 2. Select the video file that you would like to trim. 4. Click on the Timeline icon to reveal the video's timeline. The video must be added to the timeline in order for you to trim it. 5. Click on the + icon. When the video appears in the timeline, you are ready to begin trimming. In order to remove a section of the video, you will need to split it. If the section that you would like to remove is at the start or end of the video, you will only need to make one split to remove the unwanted section. If you are trimming from the beginning of the video: Move the playhead to the end of the section of the video which you'd like to remove. If you are trimming from the end of the video: Move the playhead to the start of the section of the video which you'd like to remove. 7. Click on the Split at Playhead button to split the video into sections. The video should now appear in multiple sections. 8. Click on the sections that you would like to remove. It will appear highlighted with a red border. Next, use the Delete/Backspace key on your keyboard to delete the unwanted section. 9. Click on the Export button. 10. Ensure that the export format is MP4. 12. Enter a File Name for the video. 13. Choose the Location for saving the video.